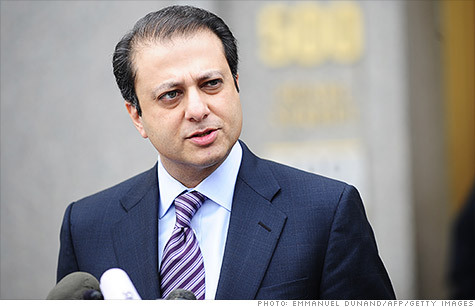 Preet Bharara, the U.S. attorney in Manhattan, whose office has handled a number of high-profile insider-trading cases in recent years. NEW YORK (CNNMoney) -- Former technology analyst John Kinnucan pleaded guilty on Wednesday to insider trading charges, becoming the latest catch in the government's ongoing crackdown. The guilty plea comes nearly two years after the 55-year-old gained public notice as a critic of the crackdown, taking to the pages of the New York Times and national television to condemn the effort. Kinnucan formerly ran the "expert consulting" firm Broadband Research in Portland, Oregon, providing hedge funds and money managers with research about publicly traded technology companies. Prosecutors say the research Kinnucan passed to clients included non-public information, such as advanced notice of quarterly earnings, in violation of securities laws. Kinnucan was accused of obtaining this information by plying sources at technology firms F5 Networks (FFIV), SanDisk (SNDK, Fortune 500) and Flextronics (FLEX) with cash payments and other incentives. A Flextronics insider also passed Kinnucan tips about Apple (AAPL, Fortune 500), with which Flextronics worked, according to the complaint. In announcing Kinnucan's plea, the FBI said he had repeatedly tried to obstruct the investigation, making threatening phone calls to prosecutors and a cooperating witness. Kinnucan's lawyers did not immediately respond to requests for comment. He will be sentenced in January of next year, and faces a maximum prison term of 45 years. In late 2010, Kinnucan took the unusual step of announcing on TV and in an e-mail to clients that he had been contacted by FBI agents, whom he mocked as "fresh-faced, eager beavers." He said the agents asked him to wear a wire in an insider-trading investigation targeting hedge funds. In an op-ed published later that year in the New York Times, Kinnucan accused the Justice Department of trying to "retroactively criminalize what has been common practice for years." "Research providers are constantly struggling with the question of what constitutes appropriate information for our clients," Kinnucan wrote. "Most of the picture here is gray, with a thin margin of black and white on either side."